Publisher’s Statement: Joan of Arc: Her Image in France and America celebrates the cultural legacy of a medieval French heroine who led the armies of her nation to victory against the English, who was tried on charges of heresy, and who was burned at the stake in Rouen in 1431. … Saint Joan endures as one of the most famous people of the Middle Ages, and her extraordinary life has engaged generations of historians, writers, artists and—most recently—Hollywood film producers, many of whom have used her image to stir an astonishing array of passions. 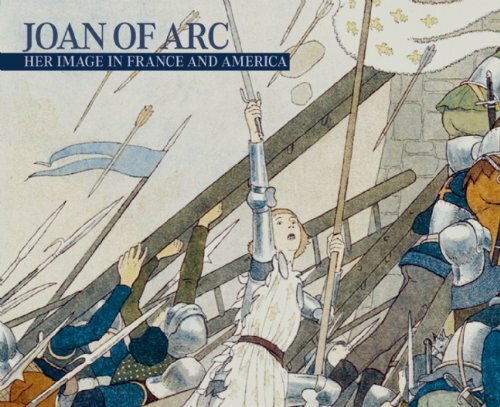 This highly illustrated book, published on the occasion of a major exhibition at the Corcoran Gallery of Art, is the first to explore the history of Joan’s image both in France and the United States. For several centuries representations of Joan have reflected the historical contexts in which they were created, and have been used to promote a huge variety of political, cultural and religious views. These range from icons of martial ascendancy and nationalist unity to paragons of humble piety and maidenly purity, supporting both the power of the people, and the divine right of kings. Posted in Cultural impact, NonfictionTagged Her image in france and america, Joan of Arc, Laura Coyle, Nora HeimannBookmark the permalink. I loved the authors’ no-nonsense assessment of how artists through the ages have appropriated Joan’s image to make points relevant for themselves and their audiences. While the authors point out historical inaccuracies in cultural depictions, they also recognize that historical accuracy is not always the artist’s goal, and they let the art speak for itself without judging. Joan’s story can be viewed through a very cynical eye as well as a very romantic one and somehow it’s all true. The book is packed with full color images of Joan-related artwork including pop culture materials, and the authors do a great job of providing the context so the reader can better understand the artwork as originally intended without letting the text ever overshadow the artwork itself.